Gregore and I travelled to Paris for the first time to attend our annual AJDC retreat. We met up with all our friends, luminaries like Merry-Lee Rae, Linda MacNeil, Scott Keating, Adam Neeley, Barbara Heinrich, Susan Sadler, George Sawyer, Michael Bondanza, Ricardo Basta, Whitney Boin, Elizabeth Garvin, Diana Vincent, Pascal Lacroix, Mark Schneider, Alishan Halebian, , John Iverson, Kent Raible, Michael Good, Elizabeth Garvin, and Diana Vincent. When we are together with the best jewelry designers in the US we are inspired by their clothes, their accessories, their jewelry, it is like a crash course in design. Paris is such a beautiful city because of its architecture and parks. We extended our stay by 10 days beforehand, and happily were able to celebrate Gregore’s birthday with our fellow AJDC members and their partners in a bistro in the Marais district, a trendy area in the 3rd Arrondissement. As first timers our focus was to visit the museums and major sights listed in travel books, and, of course, to partake of lots of traditional foods, like the baguettes, croissants, cheeses, ice creams, sorbets, plums, hazelnuts, and pastries. Our go to lunch was to stop at a Boulangerie, grab a baguette sandwich, a salad, and several pastries. We would already have some wine on hand and enjoy our meal, people watching and communing with nature in the Tuileries Garden which was so intriguing for its giant trees in neat rows with canopies cut into elongated rectangles. 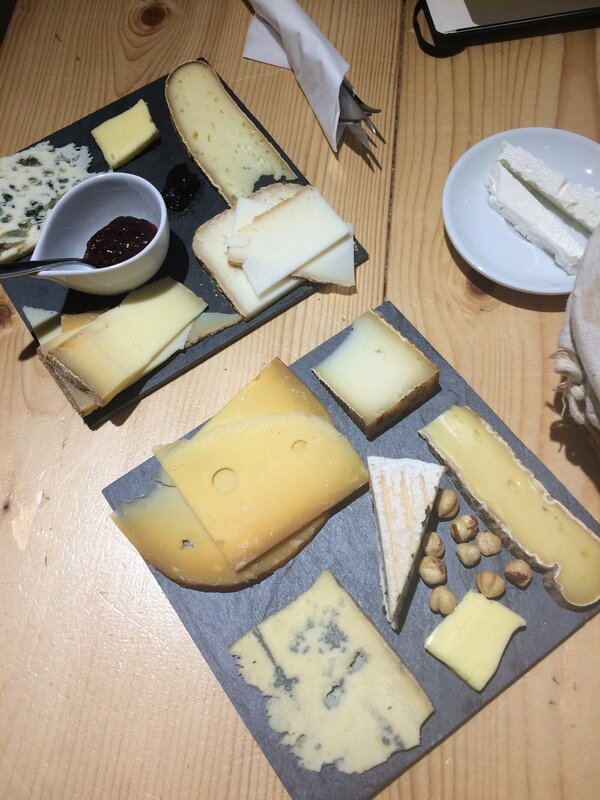 Cheese tasting with 10 cheeses, fig jam, french butter and hazelnuts, baguette and wine! Yum. The highlight culinary adventure was Saison’s, a cheese store just around the corner from where we stayed, owned and run by Mariette and Frédéric. Searching for a career that fed her spirit, Mariette found her calling, love of cheese and making people happy, while accompanying Frédéric on his concert tours. For modest fees, we indulged in extensive and very exotic, traditionally made cheeses, with this delightful couple who spoke excellent English and entertained us also, to our delight, with cello playing . We went there many times for tastings and to grab a baguette sandwich made with their exquisite cheeses for lunch. We can safely say we brought back 6 kilos of different cheeses which they kindly vacuumed packed for international transport. They are a very engaging, knowledgeable couple and I would hope anyone reading this blog to jot down Saison’s as a must see visit on the next trip to the Marais in Paris, France. Because during August many shops are closed we were sorry to miss JAR, the exquisite jeweler, but made up for it by, in the same neighborhood, having a great visit with Lydia Courteille jewelry designer and her delightful husband. Lydia creates a world of fantasy with her colorful, whimsical jewelry worn by fairy-like models against equally exotic backgrounds. We were awestruck by standing in front of René Lalique’s doorway. It is his jewelry designs that spur me to become the jeweler I hope to become, enthralled with nature and the fine craft of jewelry making. In Paris near the Seine René Lalique had an apartment. 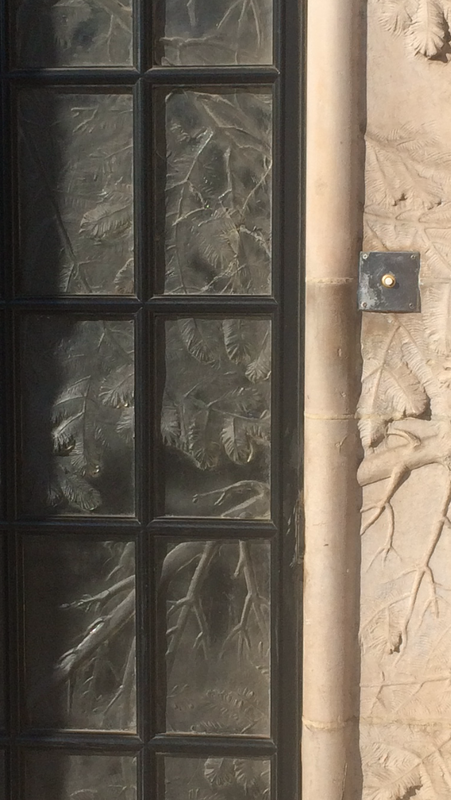 The door fit his style, the concrete cast edging of branches and leaves transitioned into carved, cast glass door panels with the same motif. Gregore and I have returned to Santa Barbara, CA, from Paris filled with ideas for our own line of jewelry and for our clients’ custom jewelry designs. Vacations, even if business related, refresh the spirit and make us appreciate the cultures of this extraordinary world that we are blessed to live in.